Virtual trading applications are just as important, if not more important, than the colorful scrolling tickers, LCD screens, and research software that universities typically buy for their trading rooms. 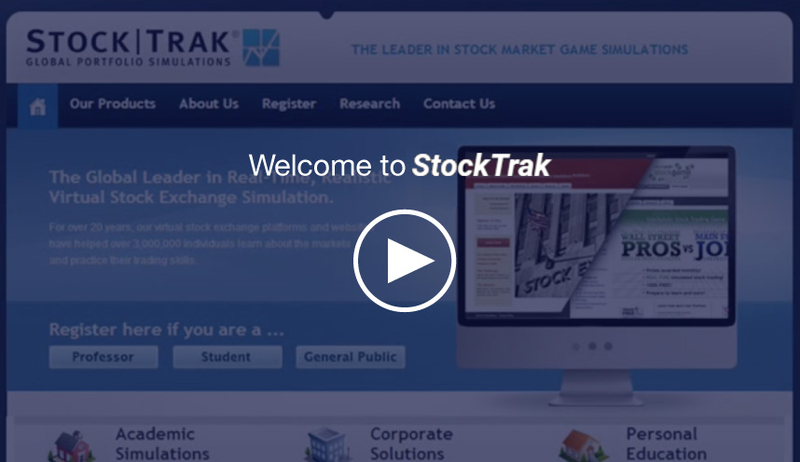 Watch the videos on this page to learn more about Stock-Trak’s virtual trading application and how it can be designed to make sure your students get the maximum use of the trading room. Stock-Trak offers 4 unique ways for universities to access its virtual trading platform, ranging from a fully customized sited branded with the universities colors and logos, to a site license, to individual accounts. Please watch our intro video above, and you can browse some of the custom branded sites used by other universities and schools below. If you have any questions at all, please call us at 1-514-871-2222 ext 232. Want to try a branded site for yourself? Penn State University uses branded simulations at the Altoona and Behrend campuses. Bloomsburg University of Pennsylvania, commonly referred to as Bloomsburg. Cardiff Metropolitan University, formerly University of Wales Institute, Cardiff, is a university situated in Cardiff, Wales. Central Connecticut State University is a regional, comprehensive public university located in New Britain, Connecticut, United States. Durham University is a collegiate public research university in Durham, North East England. Hampton University is a private historically black university located in Hampton, Virginia, United States. Hood College is a co-educational liberal arts college serving 2,365 students, 1,359 of whom are undergraduates. Howard University is a federally chartered, private, coeducational, nonsectarian, historically black university in Washington, D.C.
One of Canada’s largest community colleges offering over 120 full-time diploma and certificate programs. Johnson & Wales University is an American private, nonprofit, co-educational, career-oriented university with four regional campuses. Le Moyne College, named after Jesuit missionary Simon LeMoyne, is a private Jesuit college in Syracuse, New York. Montclair State University is a public research university located in the Upper Montclair section of Montclair. Nottingham Trent University is a public research university based in Nottingham, Nottinghamshire, England, United Kingdom. Sage College of Albany, SCA for short, is located at 140 New Scotland Avenue, Albany, New York, 12208. The University of Texas at Austin, informally UT Austin, UT, University of Texas, or Texas in sports contexts, is a public research university. The State University of New York at New Paltz, known as SUNY New Paltz for short, is a public college in New Paltz, New York. The Holy Spirit University of Kaslik, is a private Catholic university in Mount Lebanon, founded in 1950 by the Lebanese Maronite Order. Concordia College is located in Moorhead, Minnesota. Wichita State University is a public research university in Wichita, Kansas, United States. The N. Murray Edwards School of Business, also known as the Edwards School of Business, or simply Edwards. Suffolk University is a private, non-sectarian research university located in downtown Boston, Massachusetts. Corvinus University has the first of its kind trading room, located in Budapest, Hungary. Harris-Stowe University recently opened their trading room powered by StockTrak through a partnership with Wells Fargo. Ithaca College uses their custom platform to operate both a high school challenge with their admissions team and operation of their trading room through StockTrak. Medgar Evers College is part of the City University of New York, located in Brooklyn, NY. Monash University is located in Melbourne, Australia. It is one of the 1% of global business schools to achieve the ‘Triple Crown’ accreditation. The County College of Morris is a public community college located in Randolph, New Jersey. Prairie View A&M University is a historically black university located in Prairie View, Texas. The Manning School of Business at UMass Lowell is one of the leaders in business education in the United States. The Faculty of Mathematics at the University of Waterloo recently integrated StockTrak with their Mathematics and Accounting programs. Bring your trading room to life with Stock-Trak’s University-branded virtual trading software. It is like having your own private version of StockTrak.com, but branded with your University’s logos, colors, links and sponsors. Now every class that uses the trading room can create its own trading challenge lasting a day/week/semester/year — it’s totally up to you! No trading room is complete without virtual trading software. Find out why 30+ universities have already integrated Stock-Trak’s Virtual Trading software into their trading room. Customize your virtual trading website with your university’s logos, colors, and sponsors. Our webpage design is extremely flexible to help you make the most of the trading experience. Integrate helpful links and social media features like Facebook and twitter. Post announcements to communicate with your students. Watch this video to learn how flexible the design is. Your virtual trading site will have access to Stock-Trak’s full data feed, which is currently at 50 global exchanges and growing each year. The U.S. data is real-time and most global exchanges are either real-time or delayed. Our trading pages also feature limit, stop, and trailing stop orders to make your students’ virtual trading as realistic as possible. If you want to receive more information, please fill out this Contact Form. Tell us more about your program or organization so we can match you to the best solution.